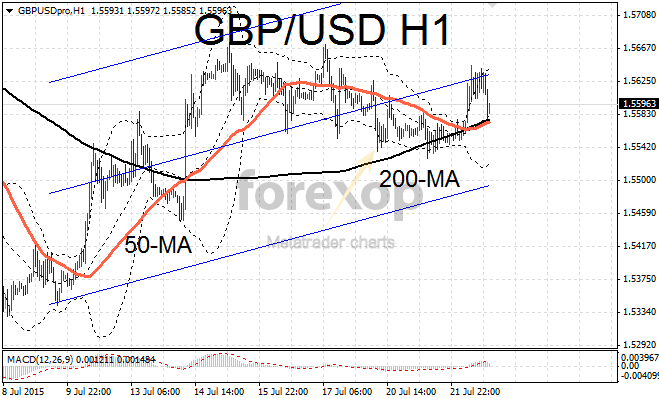 GBP/USD had its first daily advance on Wednesday after six down days. “Cable” rebounded from the 50-day moving average where support was forming a solid floor. Buying interest fell back after the pair moved up to 1.5626 and this initiated a slide back down to 1.5595. The gains in cable would have been larger had the dollar not been well supported over the session. On the hourly chart support has established around the crossing of the 200/50 50 moving average lines. 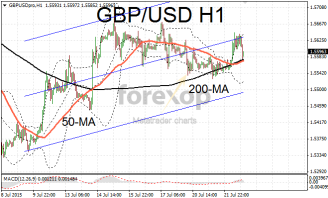 After testing the lower support several times GBP/USD is positioned to attempt another upwards break. The Bank of England’s rate setting committee voted unanimously to keep UK interest rates held at 0.5%. The minutes of the last monetary policy meeting also revealed that board members were more “closely split” on the decision this time on when to lift rates. Some members felt there was a need to raise borrowing costs sooner to keep inflation within the bank’s target 2% range. Most significantly the risk of keeping rates on hold for too long was seen as outweighing the benefits. This comes in the wake of recent wage growth data which showed earnings now rising consistently ahead of inflation. Markets view a strong likelihood of interest rates rising towards the end or the in the first half next year. However much of this information is already reflected in value of sterling. The pound advanced against most other currencies. Sentiment in yen was soft and this helped GBP/JPY to advance back above the 193 line. The yen was weaker across the board after an industrial outlook report showed that economic activity remains depressed. Despite early gains in the euro EUR/GBP fell back below the key 0.7 support area. Although at 0.6993 the pair remains above the deep lows hit last week. The next major support lies around .6708 and the lower at 0.6677, a level that hasn’t been visited since 2007.